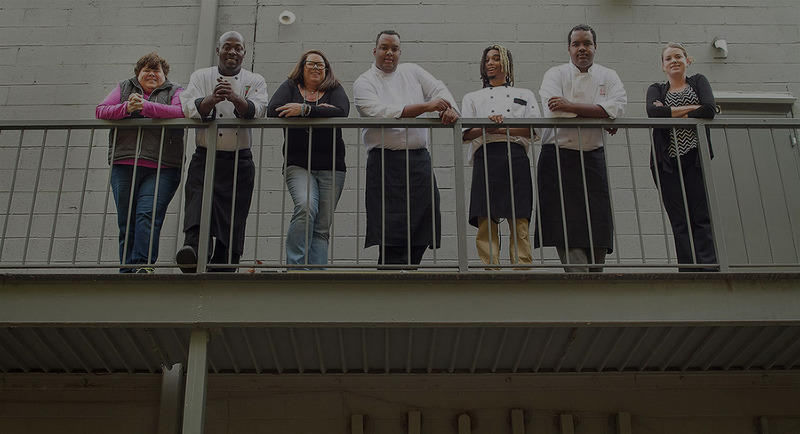 Three Sisters Catering is among Atlanta’s newest and most unique catering ventures. From hip and haute cuisine to down-home meals with a surprising twist, Molly and Kate Holway and their team continually WOW local foodies with creative approaches to catering. So kick back, relax, grab a cup of coffee while checking out our menus and give us a call! With Sister Molly, it is always about people. She has spent her entire career in sales and marketing, learning early on the value of long and lasting relationships with her clients. To this day. this is her signature style. She is Three Sisters General Manager. Molly first established herself in the biz at Atlanta’s iconic Rupert’s Night Club; the “hottest” ticket in the city back in the mid-eighties. From there she took on the “real business of off-premise catering” booking space and managing events for several of the city’s prestigious caterers and newly–renovated high-chic facilities. In 2005, she was on the Georgia Aquarium’s start-up team, in sales with Chef Wolfgang Puck. From there she scurried up the corporate ladder to manage sales for Atlanta’s legendary Tony Conway at A Legendary Event. FAVORITE TSC TREAT: Anything TSC Pimento Cheese. Kate is the sister who assures that every minute detail of your party is in place. From sales through operations and production, she is on a first name basis with every aspect of the catering business. She didn’t get there overnight. Along with twenty plus years in Atlanta catering, Kate completed an eight-year stint training with chefs along Florida’s lush Gulf Coast. Among her many notable credits are working alongside entrepreneur Michael Novilla to open St. Petersburg’s avant garde Nova 535 event facility, and with Sarasota’s Mattison Culinary Group’s highly-celebrated “Un-Gala” events at the Ringling Brothers Museum. FAVORITE TSC TREAT: Baked Potato Soufflé. Matthew Bent is another gift that keeps on giving. Working hand-in-hand with Sam, Matthew is free to pursue his passion in the Three Sisters kitchen. He’s “edgy.” Original. Enthusiastic. He consistently comes up with food that’s fresh, fun and appealing to a new generation of foodies. Matthew began his love affair with food as a Line Cook at a Sandals resort in His native Jamaica. Five years later – and still in his teens – he had worked his way up the food chain to become a Sous Chef at a leading Atlanta catering company. There he and THE SISTERS hooked up and the rest is history. The pair continues to put Three Sisters on the map with every single order that leaves our catering kitchen. FAVORITE TSC TREAT: Mexican Street Tacos. Simon, our newest member of the Three Sisters family is from Ocho Rios, Jamaica, honing his culinary skills at a very early age. Upon graduation from high school, he decided to turn his cooking passion into a career. He attended and graduated from the Runaway Bay Heart Hotel and Training Institute and has graced several Atlanta kitchens as a prep cook, kitchen manager and event manager. Simon loves to work with Caribbean flavors, he’s an expert with fish and shellfish and wicked mean on the grill. We’re the lucky ones, though… He’s our “Little Whippersnapper” and we hope he’ll stay awhile!!!! FAVORITE TSC TREAT: Braised Short Ribs. Jean Basile…Our Haitian born-New York raised-Southern Boy. Habitually smiling, Always talking, Lover of ALL Italian, Explorer of Herbs and Spices!!!! Coming from a large family with three sisters and two brothers, Jean’s passion for food came to life when his mother insisted that the Basile kids WILL learn to cook. And that, folks, he did, And he does it well!!!! Working with Compass Dining Group in Memphis for many years as Executive Chef, Jean traveled..a lot, learning, training and honing his culinary skills, opening his palate to various regional and ethnic culinary adventures. And now it’s our turn to have Jean…and we’re the lucky ones!!!!! FAVORITE TSC TREAT: Beef Wellington, Horseradish Cream Sauce. is our native Atlantan..a true Southern Peach. She loves food..cooking it..designing it..eating it. She loves to travel to run races and every time she does, she goes on a walking food tour to experience the regions culinary delights. Speaking of food, she worked here in Sandy Springs at the iconic Brickery as a manager for 18 years. Upon the Brickery closing, she spent the next few years honing her off-premise catering and event skills. Through the years she has developed a love of food, people and parties! Katie is a graduate of the University of Alabama, Roll Tide! !, and loves everything about Bama football. She is also an avid runner, running close to 50 Half Marathons and 13 Full Marathons since 2011. She volunteers at the Atlanta Track Club as a volunteer coach and volunteers at many local races. Lastly, Katie is also our resident musician, playing the piano and the flute, recently retired from teaching piano lessons. Katie’s favorite food from TSC is the Braised Short Ribs Hands down! Everything Is Fresh – Everything Is The Finest Quality. Everything Is House-Made – Wth An Oversized Dash Of TLC. Old Favorites Are Revived With Cool And Unexpected New Twists. We sincerely appreciate your support of our family-owned and operated business. At Three Sisters Catering, we are committed to cooking up a world where there is a place for everyone, are proud to serve the Atlanta gay community.